Hello and welcome back to the El Charrito blog! We hope that you had a wonderful holiday season and are excited to begin a new year. With the coming of a new year, comes the setting of New Year’s resolutions and refocusing on goals. If you are like many, you are probably setting some health goals to detox from holiday food and drinks and to start getting ready for summer. You are may be thinking that you have to cut out most foods that you love to eat salads and kale. 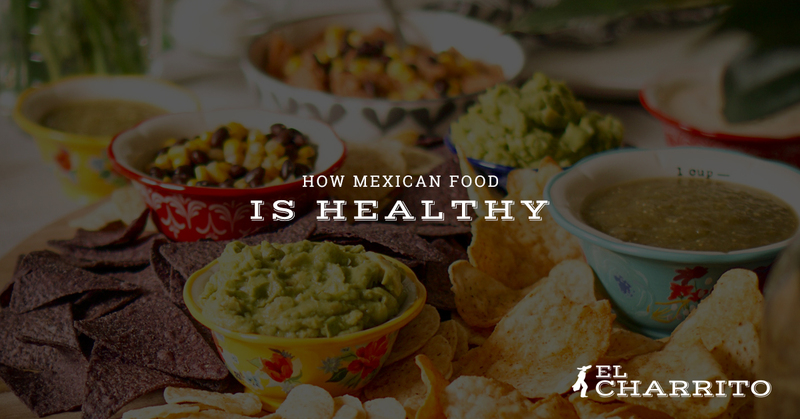 Today, on the El Charrito blog, we are going to share the health benefits of Mexican food and why you can still stop into our Salinas location in Monterey. It’s easy to think that you have to abstain from all those authentic Mexican dishes that you love, but today, we are going to show you why you can still enjoy the food offered at El Charrito, even when you are trying to watch your waistline. Protein is an essential nutrient to keep your body going throughout the day. Even though carbs and fats can provide the energy that you need, protein offers long-term energy that will keep you going throughout your day. It is also an essential building block for muscle repair and growth. Get some of your daily protein needs met when you enjoy our beans, marinated meats, and more. Fiber can not only help you feel full longer, but it can also lower your cholesterol and keep your digestive system moving. One of the best ways to get fiber at our Mexican restaurant is enjoying our delicious beans! They also offer protein and iron — and are delightfully delicious! From vitamins C and K to flavanols, cuminaldehyde, and more, Mexican food has a lot to offer when you’re looking to get your daily essential vitamins and minerals. Tomatillos, limes, and tomatoes both have vitamin C which is a main nutrient for keeping your body healthy and fighting off germs. Flavanols can be found in mole and are part of what will keep your heart and brain healthy and cuminaldehyde provides antibacterial properties and can be found in — you guessed it — cumin, one of our main spices. One of our favorite ingredients is the avocado and it isn’t just because of its beautiful green hue or its taste. Avocados are chock-full of the monounsaturated fats. These fats can help keep your heart healthy, provide energy, and are an essential nutrient for many functions within your body. We at El Charrito are by no means nutritionists, but we hope you enjoyed learning a little more about what is in your food and how what you can get at our restaurant can nourish your body. Stop into our authentic Mexican restaurant in Monterey to get food that will satisfy your taste buds and feed your soul.